Image ©2011 by PopArtDiva.Com. All Rights Reserved. No permission given to copy, print, distribute, e-mail, share, post or reproduce without a licensing agreement from PopArtDiva.Com. 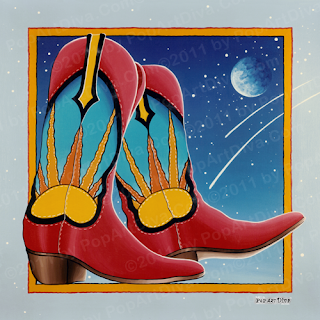 Like Sunrise Sunset, Ya'll, this cowboy boot illustration was part of a series of original acrylic paintings on gallery wrap canvases. I did this piece a little less realistic than Sunrise Sunset, using more of a pop art, cartoon style on the boot itself. The background of this piece - as well as the whole series - is a cosmic theme, something you'll notice in much of my work. I did some science fiction illustration once upon a time and my favorite part was always painting the skies. I've always loved suns, moons and comets and stars and they've shown up as my backgrounds in my work on a regular basis throughout much of my artistic life. (Take a peek at my series of Carousel Horses & Pierrots on my Carousel Corner Store for another example of my use of cosmic backgrounds.) Outer space elements have been a recurring theme in my art no matter what my main subject matter was, I love to use the cosmos as a background. At the time of the series I was doing art shows mostly in Arizona and New Mexico so I incorporated a little bit of the desert in the background with a couple of Saguaros. When I first went out to the Southwest I thought the landscape had a kind of extraterrestrial look to it. Parts of the desert are very barren with a stark and foreign look that reminded me of some of the sci-fi illustrations I'd done of alien worlds. With my love of painting space it seemed natural to incorporate that into this series. This is painting two out of a series of four, so keep an eye out in the next couple of weeks for the last two pop art cowboy boots of the series. Can be Customized for your Logo or Product! As I've mentioned before, I've been a professional artist for quite a long while. Over that time I've done original work in every two dimensional medium and a few three dimensional mediums and I keep photos/copies of almost everything I do. I've also done a lot of different subject matter over the years. This gives me a large library of images that I can draw from for inspiration for new work or to re-purpose in a new design - and I take advantage of that library whenever I can! I believe in revisiting my body of work to stimulate my imagination and to revisit an old design with a new style for a current series. When I was going through one of my portfolios (the old fashioned kind with real pages, not digital) I found a series of colorful cowboy boots I'd done for the art shows in the West and Southwest. They were large, good quality photo reproductions of fun, colorful and stylized cowboy boots with cosmic - landscape backgrounds done as original acrylic paintings on canvas and a even few wooden plates, and they fit right into my current pop art style! In this case, the reproductions of the boots were of such high quality and large size all I needed to do was scan them in sections - my scanner only takes a standard letter size - then "stitch" the sections together in photoshop. 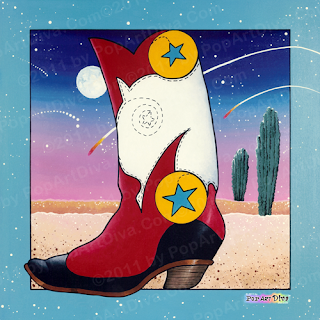 I did a few little cosmetic changes and I had some cute Pop Art Cowboy Boots for The PopArtDiva Gift Gallery! The inspiration for the original paintings actually came from some of my own cowboy boots I was wearing at the art shows. When in Rome. . . . I was in the West so I wore western style clothing to the shows but in my typical bright colors. I was kind of like a Pop Art Cowgirl for a while. I was in love with the beautiful and colorful custom boots that were being made for the professional riding circuit - very Las Vegas glitz kind of costumes were part of the costuming for the professional horse circuit. Some of these boots were and are works of art all on their own and those gorgeous boots inspired this series. I was posting my Scarlett O'Hara Martini for St. Patrick's Day when I stumbled on the fact that the title song for Gone With The Wind - Tara's Theme, had lyrics, something that I was unaware of until today. This is not the first time I've discovered some lost lyrics for some themes and tunes we're all familiar with. Image ©1995/2011 by PopArtDiva.Com. All Rights Reserved. Over the last 4 decades I've created and sold thousands of paintings and illustrations and I managed to keep copies of nearly all of them. I was moving the studio around and pulled out one of my portfolios from about 20 years ago and found a bunch of really high quality, professionally photographed images of several original paintings I'd done. I've done so much work over the years it's easy to forget one piece, even a series of pieces I've done. Sad, but true. 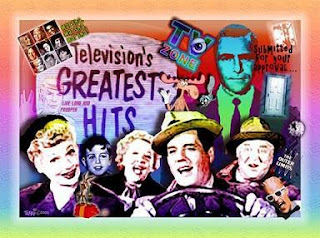 They all had my signature bright colors, a kind of linear cartoon illustration style and that pop art look of the sixties I love, so I decided I'd scan them all in high resolution and do some digital re-purposing on them. 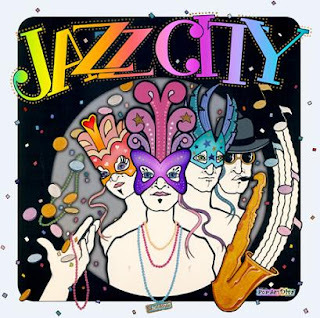 Since this Tuesday is Mardi Gras (Fat Tuesday - the day before Ash Wednesday) I started on this one called "Jazz City". I sold the painting over 20 years ago but I still like the way it captures the Carnival spirit of Mardi Gras. I'm a little late getting it up in time for selling the products on my store - in fact, I'm too late but the spirit moved me so I went ahead with this one anyway. Besides, I'm posting a Mardi Gras Martini for Fat Tuesday and I needed some Mardi Gras art for it! For those of you who are unfamiliar with Fat Tuesday, read about Mardi Gras here on Wikipedia. Check out the MARDI GRAS MARTINI for your Fat Tuesday Celebrations! at The PopArtDiva Gift Gallery. Stay tuned because I also have some cool Pop Art Cowboy Boots and a couple of other fun images I'll be revisiting and updating!